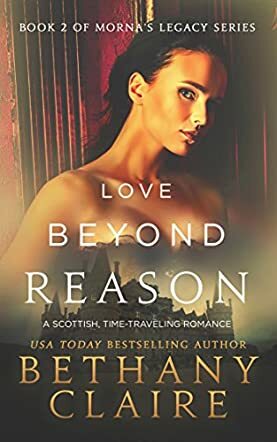 In Love Beyond Reason (Book 2 of Morna's Legacy Series) by Bethany Claire, kindergarten teacher Brielle Montgomery from Texas finds herself looking at a strange, very old portrait that looks remarkably similar to her own portrait. As she reads the description on the plaque, she finds herself being taken back to 1600s Scotland to the very place her mother has spent her entire archaeological career researching, Conall Castle. A 17th Century Scottish lass, Blaire MacChristy is forced into an arranged marriage and detests her future groom. The day of her wedding she fled to the basement of the castle to find herself staring a portrait of herself. As she reads the description beneath, she finds herself being taken to Conall Castle, only it's in ruins and the year is 2013. Each girl must adjust to the scary and new life style of a different time, pretending to be the other. Bethany Claire creatively introduces readers to the power of witchcraft, and the power of true love and friendship. The plot thickens in book 2 of the Morna's Legacy Series as the author depicts 1600s Scottish villains, evil people, and their plans to destroy everything and everyone in their path. The methods of transportation, weaponry, language, mannerisms, attitude, clothing, and actions of the characters within the book are very vividly and creatively described - it is as if the reader is watching a show on television, not reading a book. Love Beyond Reason should be read after reading book 1: Love Beyond Time to ensure a better understanding of the characters and plot for the reader's enjoyment.